"An easy single-crust pie. 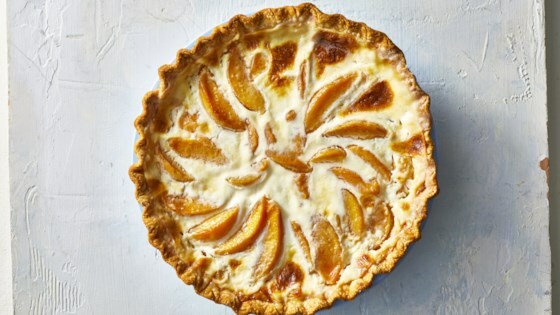 Apples also work well in this pie." Combine sugar, flour, salt and nutmeg. Add to the peaches and toss lightly. Turn out into pie shell. Pour whipping cream evenly over top. Bake in a preheated 400 degree F (205 degrees C) oven for 35-45 minutes or until firm and golden brown on top. Chill for several hours before serving. quick, easy, and rich and delicious. used a graham cracker crust, so cut down on the peaches slightly to fit. going to try with strawberries next! great company pie. I thought it was great. weeks after I made it my uncle commented on it. Be sure to purchase a deep dish pie crust. I am going to try it with apples, since they are in season. Sooo.. easy. Fabulous! It came out of the oven pretty runny, but set perfectly after being in the fridge. I added a little rum to the peaches, and used whole wheat flour....EXCELLENT!